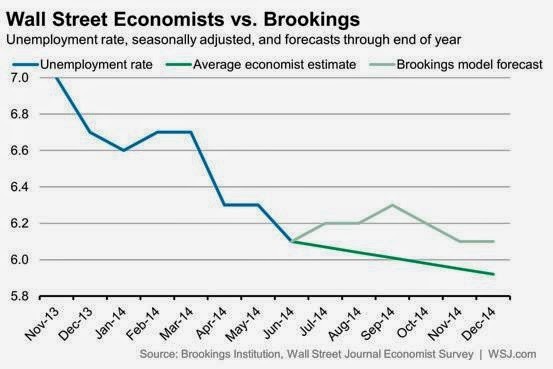 This WSJ chart has been bounced around the web a bit with comments pointing to how optimistic Wall Street economists are on US labor markets relative to the Brookings forecast. The reality is just the opposite. Brookings model assumes that as labor markets improve some of those who had left the labor force will return in an attempt to find work. That will increase the unemployment rate (more people "officially" looking for work). Wall Street economists on the other hand don't believe many of those folks are coming back any time soon, as the unemployment rate continues to fall.